It has been possible to legally purchase recreational marijuana (cannabis) in the US since 2014. Washington and Oregon pioneered this move, and since then, several states followed. The jurisdiction has allowed any adult who is at least 21 years old to either possess or purchase recreational marijuana. 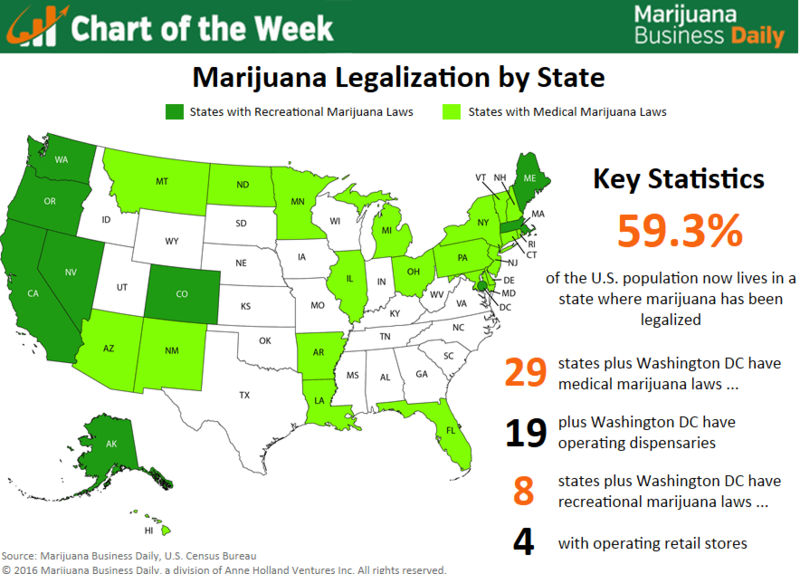 Where is Recreational Weed/ Marijuana Legal? Many of the state's dispensaries couldn't get enough marijuana earlier this year to satiate the needs of their clientele. The shortage caused some to sell out of their product within hours of opening. Legalizing weed doesn't actually grow weed – that takes time. Good news is that you can possess up to an ounce with no fear of penalty. You can keep up to four ounces at home if you own a property in Alaska. But, if you get caught with any more than an ounce, you can get smacked with a $10,000 fine and a year in the slammer. They can also slap you with a $50,000 fine and five years behind bars if you walk within 500 ft. of a school or recreational center. Just keep cool and put your weed away from the kids. Possessing weed is now legal in the Golden State. However, you can't smoke it in public. It may not seem like news because everyone in California who wanted has been able to smoke weed legally since 1996, when it became the first state in the nation to practically allow medical marijuana. Legislature in California is taking its time setting up a regulatory system for recreational pot dispensaries by 2018. That means you can't get arrested by state and local cops for having up to an ounce of weed. You can still get fined by $500 if you sell any amount, although you can give away or receive up to 28.5 grams. Colorado was leading when it came to setting up its foundation for recreational pot law. Colorado’s medical marijuana culture is in part because it had taken root in the state itself. “One of the biggest differences between the states is whether or not there was a medical marijuana distribution system in place before the adult use law passed,” O'Keefe says. Stop by one of the state's many dispensaries. However, make sure to do it when you have the chance, or you may be left on the top of a mountain without a hit. That is because the state's legalization law left it up to each locale to decide for themselves if they want weed shops. Most of the state’s lawmakers are pretty restrictive. Book a cheaper flight into Denver. You can basically find anything you want in Denver for whatever price you can afford if you are 21 or older. You can't legally smoke or vape outside in Colorado, which has been a huge debate. Many hotels don't allow smoking pot in your room so the edible culture has become strong in the state. Those edibles take a bit to kick in and can often catch the unassuming off guard. This can give you more of a paranoid scare than the gentle high you were chasing. Also, there’s option if you prefer inhalation. Several marijuana bus and limo tours exist throughout the state. These allow you to smoke inside the vehicles as they take you on scenic rides around town. The state's lawmakers have presently shelved plans to allow marijuana clubs. However, about 30 private clubs exist and many sell day passes. Be reminded that these are in a legal gray area so the authorities may stop by unannounced. Fewer than 3,000, a slim majority, passed a law allowing those other green trees to be regulated like booze and to allow pot clubs. Those are bars with bongs. Maine legislature seems to be taking its sweet time setting up a regulatory administration for weed. In fact, the only thing the legislature and Republican Governor Paul LePage have been able to agree on was raising the legal age to smoke weed from 18 years old to 21, which the voters agreed to. It's still illegal to sell weed with no regulatory regime in place and lawmakers taking their time in passing one. People there have been enjoying legal recreational weed in Portland, Maine since back in 2013. That city earned the title of the East Coast's first city to legalize greenery. At 3.8 percent, Maine is tied with California for the most citizens with medical marijuana cards. While it's been legal to smoke and possess up to an ounce of weed since last December, it remains illegal to sell or buy weed. The legislature was planned to set up its regulatory regime this year with a start date for pot shops to open in January 2018. But, anti-pot lawmakers voted to move the date back six months. Republican Governor Charlie Baker signed the bill. Now, lawmakers now have until at least July 1st, 2018 to set up a regulatory system. It can even get pushed back, too. Lucky for residents there's still medical marijuana dispensaries in some parts of the state. Luckily, legislators from the ‘Sin City’ are working to quickly set up regulations to govern the state's newest legal pastime.Their state resolution passed last November. So now, you can legally possess up to an ounce of the goods. You can get hit with up to a $600 fine if you get caught with even a gram more than that. Public smoking is also not allowed. But, there's a chance this could all change soon. Lawmakers here are hoping to follow Colorado's example and just legalize cannabis, possibly getting their recreational system of licensing and taxation up as early as July. Oregon's marijuana law left it up to individual counties to decide for themselves if they want weed sold like alcohol. Most of the state is quite rural, conservative and even a little backwoodsy. In fact, the state is almost split in the middle. It has 20 counties mostly to the west allowing legal pot. Sixteen counties, on the other hand, mostly in the eastern part of the state all prohibiting greenery. It's against the law to smoke or even partake in edibles in public places. Although, some hotels along the coast allows toking. Make sure you don't have more than an ounce on you if you’re heading to the woods. It's illegal to possess any more than that in public (though you can cultivate up to eight ounces on your property). It's also still illegal to get high on federal lands. Smoking pot in public at Washington State is fine. You can even smoke in a park! Those restrictions apply to most all of the states that have legalized recreational weed, however, Washington is slightly different. You can't legally grow your own weed, unless you have a medical card. In here, restrictive marijuana laws allow you to have just one ounce in private, though state-controlled dispensaries are popping up all over the more progressive areas. In the past year, they rolled the medical dispensaries into the regulatory system for recreational stores. This forced those stores to either get a new license or be shuttered. Needless to say, pissed off a lot of loyal medicinal customers. Majority of the residents voted in overwhelming favor to legalize recreational marijuana in November 2014. This took about a year to put into practice.It allows people to possess up to two ounces of pot and “gift” up to one ounce. But, neither money nor goods/services should be involved. 7 Weed Hacks for the Entrepreneur. Weed in the Workplace? Best Dry Herb Atomizers & Tanks: Our Top 5 Picks! Top Weed Apps for 420-Friendly Singles -Find Your Canna-Mate! Marijuana Drug Test -Can You Get a DUI for Being High on Weed?